"He's my friend." "So was I." That is part of a brutally honest conversation between Chris Evans & Robert Downey Jr. in Captain America: Civil War, the greatest superhero film ever made. 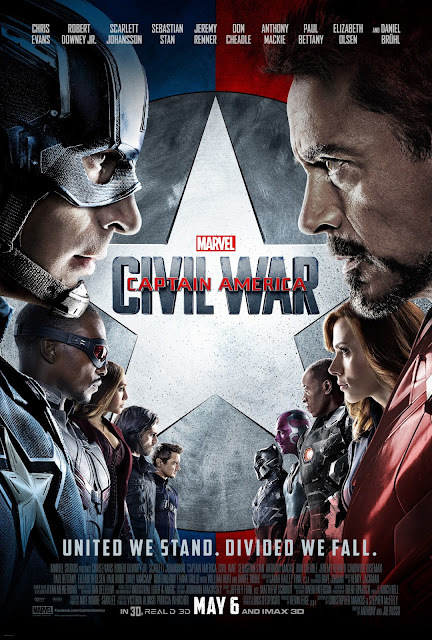 Evans portrays Steve Rogers, AKA Captain America, who has just been involved in a severe incident, involving him, Sam Wilson, AKA Falcon (played by Anthony Mackie), Natasha Romanoff, AKA Black Widow (portrayed by Scarlett Johansson), & Wanda Maximoff, AKA Scarlet Witch (played by Elizabeth Olsen), who had caused the incident by accidentally killing 11 missionaries from the Republic of Wakanda in an attempt to stop the theft of a biological weapon. The Avengers, save for Bruce Banner, AKA Hulk (who is in hiding), & Thor (who has returned to Asgard), are notified of the ratification of the Sokovia Accords, which will have the Avengers run by the UN. Rogers is against this, while Tony Stark, AKA Iron Man (played by Robert Downey Jr.) is for it. However, at the ratification of the Accords, a bomb allegedly set by James "Bucky" Barnes, AKA The Winter Soldier (played by Sebastian Stan), explodes & kills Wakandan King T'Chaka, leaving his son, T'Challa, AKA Black Panther (played by Chadwick Boseman) to take his place & go after Barnes. The differing opinions between Rogers & Stark create friction in The Avengers. Rogers believes that Sokovian villain Helmut Zemo (played by Daniel Brühl) was behind the bombing; however, he is unable to apprehend him. Eventually, the infighting between the Avengers divides them into 2 factions: one led by Rogers, including Wilson; Maximoff; Barnes; Clint Barton; AKA Hawkeye (played by Jeremy Renner); & Scott Lang, AKA Ant-Man (played by Paul Rudd); & the other faction, led by Stark, including T'Challa; Romanoff; Vision (played by Paul Bettany); James Rhodes, AKA War Machine (played by Don Cheadle), & Peter Parker, AKA Spider-Man (played by Tom Holland), culminating in a fight that could irreparably damage the Avengers once & for all. The film was an action masterpiece. The acting was superb. The direction from the Russo brothers was excellent. The screenplay from Christopher Markus was great. And the visual effects were stunningly excellent. This is definitely the best superhero film ever made. Note to DC: This is how you make a good superhero rivalry movie.